For my Drawfriends, I decided to do a bit of romance between my more recent baker OCs, Coyota and Snickerdoodle (In the same order)! 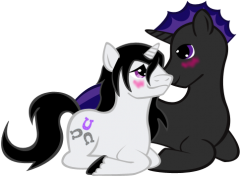 This is a vector as usual, and the background was added in to fit the Vanentine's Day/ Hearts and Hooves Day/ General Love Day??? theme! Love comes in many flavors, just like cookies. 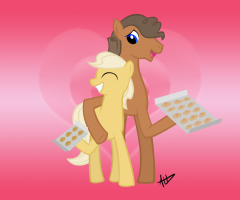 Some might prefer one over another, but in the end, everypony loves cookies! ...That makes sense, right? Your Top Ten of 2012? 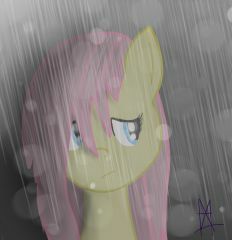 Manestream posted a topic in Iron Pony Competition 2012! All the Iron Pony competitions have drawn to a close, and all of the results have come in! Here are your Iron Ponies! Cloud Diving Scores: Winners: 1st: Pathfinder (SteelEagle) - 60 2nd: Rainbow Dash (Bramble Rose) - 58 3rd: Falling Brick (Rackenhammer) - 53 The Longest Yards: 1st: Ardent Fate (Phil the Time Wizard) 2nd: Ginger Mint (Ginger Mint) 3rd: Electric Vibe (Chocoswirl) The Super Sure Shot Sniping Session 1st - Sheriff Silverstar (Mojo) 51 2nd - Rat Pelt (Dusk Breaze) 50 3rd - Rarity (Phil the Time Wizard) 48 Tug of War 1st - Phil the Time Wizard - Gilda 2nd - Rackenhammer - Flying Brick 3rd - MisterChippy - Brighteyes Obstacle Course 1st - Chocoswirl - Electric Vibe 2nd - Phil the Time wizard - Snowfall 3rd - Rackenhammer - Flying Brick Barrel Weave 1- Gilda, 25.1 seconds. (PhilTheTimeWizard) 2- Applejack, 25.5 seconds. (riverhippo) 3- Electric Vibe, 26.2 seconds. (Chocoswirl) Cupcake Eating Challenge 1sr - Harrington Sleuth (HarringtonSleuth) 2nd - Pinkie Pie (Rosewind) 3rd - Taiko Fairy (TaikoFairy) Congratulations to all the victors! Awards will be handed out shortly so that every Iron Pony may show their stuff for the year to come! Thanks to everypony for participating, and we look forward to seeing you all test your mettle next year! * As of this time all awards have been awarded! The beautiful awards were created by Ginger Mint, thank you Ginger Mint for your help! 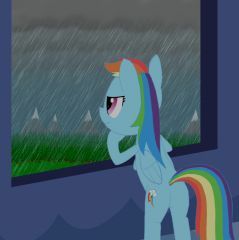 UK Bronies; Anypony going to the London Comic Con? IP2012 The Iron Pony Obstacle Course! ~The Iron Pony Obstacle Course~ A tan earth pony stands beside a starting line; a long, winding course full barrels, spotted with mud, and other obstacles stretches on behind her. Ponies have gathered along the sidelines of the course, watching contestants tackle the course one at a time. There is much ruckus as one of the participants falls into a pool of mud, ponies cheering or shouting encouragement- the whole scene is energetic, and alive with the spirit of competition! The tan pony earth pony spots you and calls out to you, her brown mane whipping in a slight breeze. Her enthusiasm strikes you as she calls out- "Welcome to the Iron Pony Obstacle Course! Do you have strength? Agility? Finesse! Speed?! Do you have what it takes to be number one?! Step on up and show us what you've got!' Event Description: Everypony can test their mettle on the obstacle course! The object is to get over, under, and across as quickly as possible to reach the finish line. The obstacle course is made up of four obstacles. The first obstacle is a long, shoulder deep pit of mud the width of the track; so cross it your going to have to get a little dirty! Sturdy, strong ponies will do well on this leg of the race! The second obstacle is a wall of barrels - stacked six high at its peak, there are too many to jump over from ground level! Each pony must be careful to scale the barrles that arent stacked as high until they can reach the top, and jump over. Be careful not to slip, some of those barrels can be wobbly! Ponies with agility will do well here! The third obstacle is a long straight stretch of the course where ponies must sprint to cross it as quickly as possible to reach the next challenge; ponies with great speed will excel through this challenge! Finally, the last challenge and fourth obstacle is a row of three thick wooden poles sticking up out of the ground. Each pony must retrieve three fresh apple pies at a nearby table, and are required to balance all three pies on their back while they weave between the wooden poles to the finish line. Move quickly, but not too quickly! For each pie that falls, there is a time penalty, so dont let those pies fall! Ponies with the utmost elegance and balance will shine brightly in this leg of the race! Event Rules: 1 )There is no flying, no magic, and no use of outside equipment; everypony must compete using their natural ability to overcome the obstacle course! 2) Only one post (run) per competitor (OC)! 3) You may participate in this event with more than one OC. However, only one post will be considered for judging, please indicate which OC/post you want to be judged in the competition at the top right of your post by adding the following: *This post submitted for judging* 4) This event is running for three days- don't miss your opportunity to give it your all! 5) All global forum rules apply- keep it clean and safe for all ages! Event Judging: This event will be judged by three simple criteria: Completion, Creativity, and Quality. There is no actual timing, or time penalties factored into the judging, the winner will be decided solely based on the overall quality of their RP based on the above criteria and following guidelines. The listed criteria will be used by the judge to determine the winner, no scores will be given or made public, and the winner will be announced upon the completion of the event! Specific information on each criteria follows: 1) Completion will be based on appropriate post length (not to short or inappropriately long), and responds to all event criteria. Completion checks to see that the competitor has met all of the requirements of the event. 2) Creativity encompasses every writer's unique approach to solving the event, how entertaining, and how original the post is. Is there character development in struggle, however small? Do we learn something about the character through their actions, thoughts, and attitude? Is it humorous, or does it make us sympathize with the character? Is it enjoyable and well thought out? 3) Quality focuses on the physical quality of the post- are there spelling errors, or grammatical errors that throw a wrench in the reading process? Does the post flow well when read? Does the post look good, or is it riddled with colors that don't match and pictures that don't fit in? This criteria focuses on basic readability and penmanship. Getting Started: All you need to do to get started is to respond to this thread with your post of your OC going through the obstacle course! 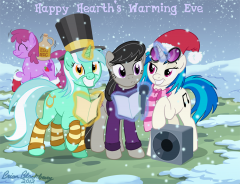 Good luck everypony, show us what you've got! There is bad weather, and then there is worse. 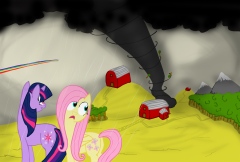 Thankfully, there are weather teams in Equestria that can counteract natural disasters like these. Poor Mystery Chaser. She can't be properly miserable like a hardboiled detective should be with all this sunshine and clear weather! I thought a thread would be in order so people can report where they've seen certain FiM things and just tell us what store they were in. Yesterday I bought FiM coloring books at Dollar General, there are 3 different kinds, they share the same pictures but they also have different pictures as well to color in each of them. There's also a smaller sticker book, I did not buy that, but I flipped through it and saw a lot of different great stickers. What have you found in various stores? Can I Be the Apple of Your Eye? Valentines Day picture!~ For Brianblackberry! I've had his idea in my head for MONTHS but I decided to wait till the appropriate day Tried a different method - colored the outlines to try and make it more 'cutesy', intead of leaving them black like I usually do in crayon style. Hope you like it Bri! Just because I don't play Lyra as human obssessed here on the boards doesn't mean I don't like that side of her fanon For the February drawfriend. Perhaps this doesn't quite fit in to the theme of "love" as well as it could, seeing as how it's more comedy, but I figure I may as well upload it here. Hope you guys like it.